Thank you for inviting me here today. I do appreciate this opportunity to speak to you about this important day in our national calendar. Today we reflect upon the selfless sacrifice of those who died and were wounded to preserve our freedom and independence. For me at least, it puts meaning on the challenges we face today and what may come before us tomorrow. Now that the original ANZACs are no longer amongst us, it is important to appreciate the priceless contribution they have made to our nation and our national character. It has been said many times over that our tradition of ANZAC Day is not to glorify war. 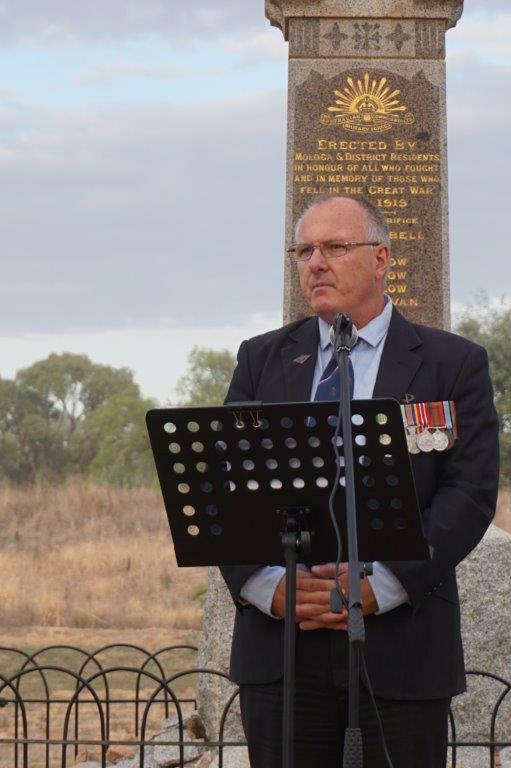 But rather it is very much about commemorating the ANZAC spirit, and remembering how those terrible events at the beginning of last century drew Australians together as a nation. On that fateful day in 1915, a group of volunteer Australian and New Zealand soldiers, many of them teenagers had to wade ashore before dawn onto a small beach on the Gallipoli Peninsula in Turkey. Not only did this ANZAC spirit stir Australians at home and abroad with a new feeling of camaraderie and Australian-ness, but it was also matched by the way that the rest of the world suddenly began to look at the young Australia – not just as an offshoot of Britain, but through new eyes as an emerging nation of truly independent character. Although ANZAC Day started as a day of remembrance for those who fought and died in the First World War, it has come to be a commemoration of our fellow Australians who have served in all wars, on land, sea or in the air. I think it is very important for all of us to take some time today to remember that proportionately, many individuals, many ordinary Australian men and women, have been prepared to volunteer and make the same kinds of personal sacrifices over the years for the freedom and quality of life that we in Australia enjoy today. And this is a debt which is impossible to repay. Today, Australians are still more than willing to defend the values of independence, freedom and fairness around the world. That spirit has been handed down over many generations especially in conflict and other adversities as we have recently witnessed both in Victoria and Queensland. The ANZAC spirit gives us the same qualities – perseverance, comradeship and courage that our forefathers so proudly demonstrated. Many young Australians continue to offer their service to uphold these values. Guinea or just in the dedication they apply to their training. Today some 2500 Australians are serving overseas in difficult and dangerous circumstances. Dispersed throughout the units deployed, are reservists reminding us again that the commitment is felt throughout the community as a whole. It was the citizen soldier that was the backbone of the 1st and 2nd AIF. Again the citizen soldier serves our nation. In Timor Leste, we helped to secure and strengthen the world’s newest nation. In both Afghanistan and Iraq, the New Zealand and Australian Defence Forces have played and continue to play a role in helping these countries towards a future free from repression and the scourge of terrorism. As we reflect today on all of the conflicts in which Australians and New Zealanders have been involved, and the many incredibly dangerous situations faced by our defence forces in other operational deployments, one thing clearly stands out. Most servicemen and women may have signed up for adventure, or out of a sense of obligation, or just wanting to be involved. And yes, they fight for our nations, our flags, our people, and their families. But as noble as these ideals are, their commitment in combat, their raw courage, and their self-sacrifice in the face of often overwhelming odds, are driven largely by those physically closest to them – their mates. From all of the insights which we now have, this is the most profound message. Mateship is at the heart of what we refer to as the ANZAC values: it drives loyalty, courage, endurance and sacrifice. It is a compelling reason for most acts of heroism, and the suffering so often experienced by our servicemen and women. Not letting down the team is a powerful motivator in our nation’s psyche. Not many of us are called upon to place our lives in danger for others. We admire those who do. We can all play our part by less challenging although no less significant actions. Following the recent lead of many in the community, we can reflect the spirit of ANZAC through our behaviour towards one another – be this a commitment to a friend in need, a desire to care for others less fortunate than ourselves or in need of help, or simply by being more tolerant, more considerate, more generous and understanding. As we gather today to remember and reflect on the opportunities and freedoms they have bequeathed to us, those whom we revere this morning would be comforted in knowing that Australians remember and honour their sacrifice. But we can take the act of commemoration to an even higher place by following their example – by committing ourselves to lead lives worthy of their sacrifice by looking after our family, friends and our fellow citizens as well as we are able. This is the test of our humanity which would make us worthy of our inheritance as we face a new day every day. And in this way we can renew our pledge of nationhood into the future by honouring those who have already served. In treasures we have found within our bowers. Let other men assess what we have done. And send us toppling back from whence we came.